There are so many GREAT ways to support Game to Grow this holiday season! 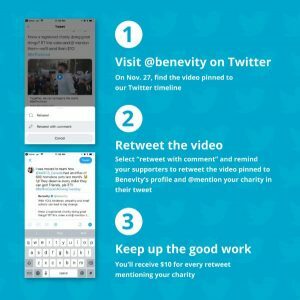 On Giving Tuesday, you can make a donation via Facebook Fundraisers, and Facebook will match the first seven million dollars of donations on a first-come-first-served basis. You can read more here. You can also earn $10 for Game to Grow by simply retweeting a tweet by Benevity, mentioning @GametoGrow! Click the image below for details! 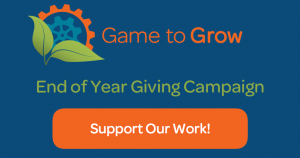 Throughout the end of the year, Game to Grow’s CauseVox campaign will be open to donations. 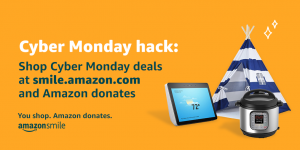 If you are planning to do some holiday shopping on Amazon.com, please set your browser to Game to Grow’s smile.amazon.com storefront, so that Amazon will donate a portion of the sale to Game to Grow! Please help Game to Grow this holiday season, so we can do so much more in 2019!